Brushing with Invisalign® doesn’t have to be a chore. In fact, it’s super easy to remove your aligners and properly clean your teeth–a huge shift from traditional metal braces. Invisalign offers a huge variety of benefits to those who value achieving a beautiful–and straight–smile, through a method that’s almost invisible to the eye! How should I brush & floss my teeth with Invisalign? Gone are the days of trying to maneuver through metal wires and brackets, with Invisalign, cleaning your teeth is just as easy as not having braces! Due to the versatility of Invisalign’s removable aligners, brushing and flossing is as simple as taking them out and brushing normally with an electric or ordinary toothbrush. We recommend brushing before and after using the aligners, to ensure the least amount of bacteria is living in your teeth, gums and Invisalign trays. After removing them from your mouth, gently brush and rinse your aligners in lukewarm water. Don’t use mouthwash alone, it’s simply not enough to remove hidden plaque and bacteria. Make sure no food residue is left in your aligners before you put them back in your mouth because darker foods, like blueberries for instance, can cause staining. Though some people like to let the aligners soak for 15 minutes, make sure you aren’t soaking them in anything corrosive to warp the trays. Don’t forget to utilize the Invisalign Cleaning System, where you can keep your aligners odor-free and remove plaque from hard-to-reach places. How long does it take? Only 15 minutes to thoroughly clean your aligners. Additionally, you can use an OAP Cleaner that removes germs, plaque and debris. Simply place the aligners over a sink and brush gently with the OAP cleaning serum. After you’ve brushed your trays thoroughly, rinse off with water. It’s that simple. It’s imperative that you keep your aligners, your teeth and gums, clean during Invisalign treatment to avoid bad breath and pesky bacteria. According to Invisalign, aligners are most effective when they are worn 20 to 22 hours per day and only removed for eating and cleaning. When Invisalign trays are removed for regular brushing and flossing, remember to put them back in as soon as possible. The more you wear your Invisalign trays the better your results will be. 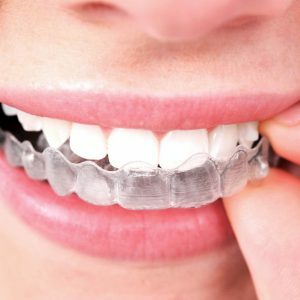 What should I avoid when cleaning my aligners? Consider using the Invisalign Cleaning Kit to clean your aligners. If you don’t own one, simply rinse in lukewarm water or utilize the OAP cleaner. Never bleach or boil the trays to sterilize because they can cause irreparable damage of the plastic.